All applications installed via Ubuntu Software Center in Precise are being added to the Unity launcher as a new option 'New Applications in Launcher' is now turned on by default. While this is a pretty neat feature, some users may find it a bit odd as after installing, you have to unlock applications from launcher if you don't want them to be pinned. Even applications like 'flash plugin' that don't have a .desktop file are being added to the launcher. Pinning these apps on launcher does not make much sense. A bug is has already been filed regarding this. However it should be fixed in coming updates as wiki says only 'Graphically launchable application' will be added to the launcher. If Unity is running, at the end of the “View” menu should be a checkmark item, “New Applications in Launcher”, which is checked by default. If the Launcher was in auto-hide mode, it should temporarily reveal itself. A copy of the item’s icon shown in USC (in the software list view or software item screen, whichever was being used) should be hoisted from that spot to a space the launcher has just freed for it, resizing as necessary as it moves. If the Launcher was in auto-hide mode, it should then hide again. For as long as the item is waiting for other package transactions, the Launcher should show it as a greyed-out icon, with the help tip “Waiting to install”. Trying to launch the item should do nothing. While the item is installing, the Launcher should show installation progress by proportionally filling the icon with color. Trying to launch the item should still do nothing. 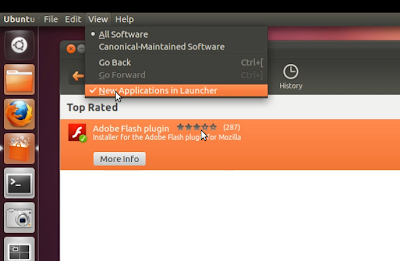 When installation is complete, the launcher item should flash and become usable. Some of the changes mentioned above and installation progress bar have already been implemented in code. What are your thoughts about this. Should this feature be turned on by default? Or it should be the other way round?